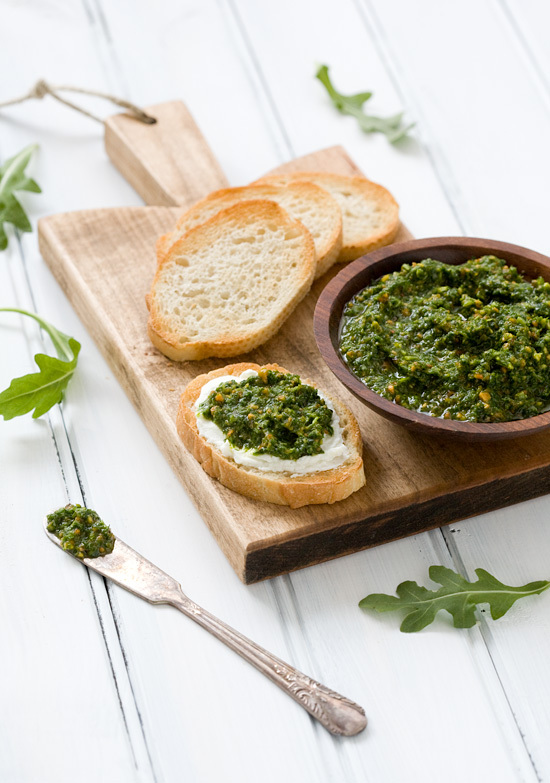 Pesto is one of my guilty pleasures…but now I don’t have to feel so guilty!! Little did I know when I posted my tips for homemade frozen pizza, that all you really wanted was the recipe for the pesto I used to make the “hers” version. If I share the recipe, will you forgive me? 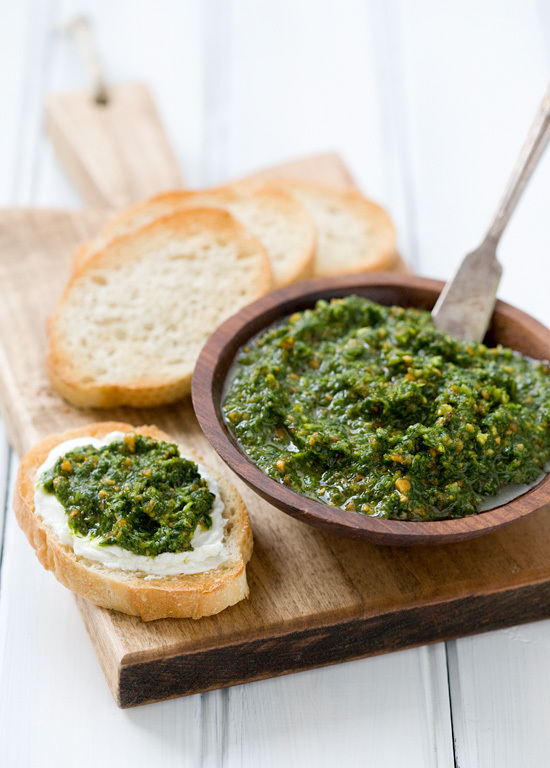 I’ve been kind of crazy about this arugula pesto lately. Maybe it’s a basil-deficiency in my blood stream, or summer herb withdrawal syndrome. But tossing a handful of bright green rocket into the food processor instead seemed like the right thing to do. I’ve probably made it a dozen times. I’ve smeared it on pizza. Tossed it with pasta. Slathered it on burgers. 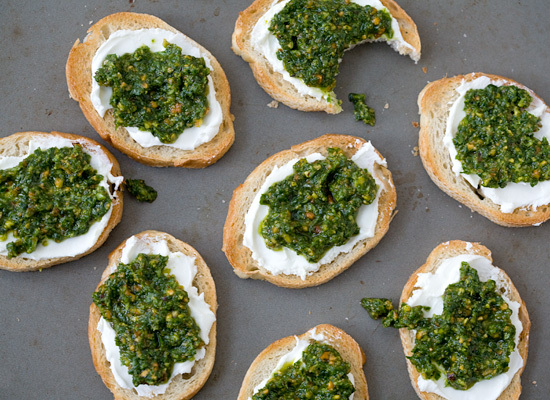 And, of course, spread it on some freshly toasted bruschetta with goat cheese. I’ve made it with walnuts, almonds, pistachios and pine nuts… added cheese and garlic and lemon. Spiced it up with red pepper flakes. But this. This is probably my favorite version. Even though I expect my freshly planted basil to be primed for pesto in T-minus 65 days (brown-thumb notwithstanding), I don’t see myself tiring of this bright and nutty spread any time soon. Basil? What’s that? Who needs it anyway. Place arugula in the bowl of a food processor or blender. Add olive oil, pistachios, garlic, and red pepper flakes. Pulse until smooth, about 30 seconds. Season to taste with salt and pepper. Use immediately or store, refrigerated in an airtight container, for 1 day. Bring to room temperature before serving.